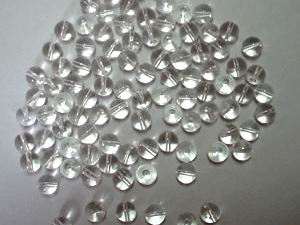 Glass beads have perfect spheres with a smooth, brilliant surface, chemically inert, widely used in wet or dry method for prestressing shot peening, cleaning, trimming, surface finishing, smooth and deburring processing in industrial fields of aerospace, automotive, and electronics. Prestressing shot peening of gears, shafts, blades, cutting tools, pipes, joints and delicate parts, propellers and hulls, jet engine components blades, vanes, valves, spindles, shafts to increase the mechanical resistance to fatigue and stress corrosion cracking and work life of the parts. Surface finishing of metal, plastic, glass, wood, etc to produce a surface with finishing from fine matt to bright satin. Removing of debris from vats, tubes, trays, utensils, tanks, removing of old coating from surface. Cleaning of machinery, dies, plates, molds, pistons, blocks, large turbines and engine castings, intricate parts. Glass beads is chemical inert, so there is no surface contamination, post treatment for removal of contamination smears is unnecessary.